In a saucepan over medium heat, melt the chocolate into the milk. Once the chocolate is completely melted, add the chipotle, very finely minced, and the adobo sauce. Remove from heat and let cool. Add the eggs to a mixing bowl, and mix on high with the whisk attachment until light and frothy — about 2 minutes. Gradually add the sugar, while still mixing. Add the cream, vanilla, and salt, and whisk to combine. Add the cooled chocolate mixture, mix well, cover, and refrigerate for 2-3 hours. 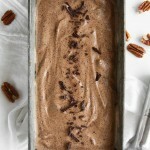 When totally chilled, follow your ice cream maker instructions to make into ice cream, adding the pecans at the end. Pour into your ice cream container and freeze for 3 hours before serving.